The Turf House Tradition is part of the Tentative list of Iceland in order to qualify for inclusion in the World Heritage List. 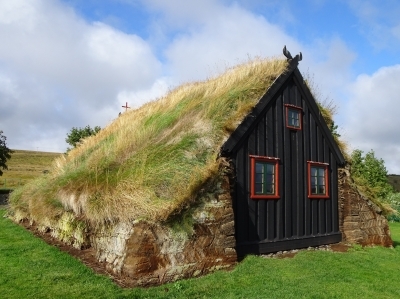 Turf houses were actually the primary (and almost solely) form of housing in iceland from the viking ages till the 19th century. Trees and timber were in very short supply in iceland. Turf houses have only a light wood framework, the roof and many walls are made out of turf blocks. Turf houses have the advantage of a good isolation, but are difficult to maintain and could only be built to a certain size - which is why even bigger turf buildings are an aggregation of relatively small huts. Turf houses only last for roughly a century, which means that all of the islandic turf houses are no older than the 19th century. Many of the buildings are mentioned in older sources, but were rebuilt again and again throughout the ages. It is not really known if the existing turf houses look like the ones in medieval times, but no fundamental difference is assumed. Arbaer: An original turf farmstead and a relocated turf church,forming the core of an open-air museum. Quite close to Reykjavik. However, the houses seem younger (around 1900) and utilize more timber in their construction, so the turf is not so dominant. Still cute. Nupsstadur: A multi-building farmstead and chapel. Viewable from the road, but is on private property and doesn't seem to be visitable. Probably not fully renovated yet. Note that there is a nice, visitable turf house nearby in the Skaftafell NP, called Sel, but that isn't included in the WHS proposal. Hofskirkja: A single-building turf church with rock walls. Well maintained, and especially photogenic because of the little grave mounds surrounding it. Not sure about the official opening times, but you can stroll around and peek inside to see the wooden interior at all times (and without paying). Vidimyrarkirkja (pictured): A little turf church in good shape. Extra turfy, as the side walls are made of turf, too. As with Hofskirkja, good to visit even if it is officially closed. Glaumbaer: My favorite. A fully equipped, well-sized farmstead with cuddly turf walls for maximum turfiness. All are in excellent condition, and fully visitable as a museum. You get a very good impression about how it was to live in such a building, and in such a harsh and isolated environment. All hobbit-hole illusions are thoroughly smashed, though. For penny pinchers: The outside can be viewed without paying, but a full visit is really worth it. All in all, I am quite confident in the OUV of the proposal, as the turf houses seem to be typically islandic, but are getting rare today. No similar structures are on the list yet. The constant need for renovation and rebuilding might be a hindrance, and the particular selection of the houses in the proposal is debatable. I could not see much difference between WHS and non-WHS turf houses. Still, the proposal is a strong contender for a worthy WHS in my opinion !